The MOLLE comes with an on-the-move tube hydration system for special missions where hands-free drinking is desired. This system is intended to supplement, not replace, the 1-quart canteen. 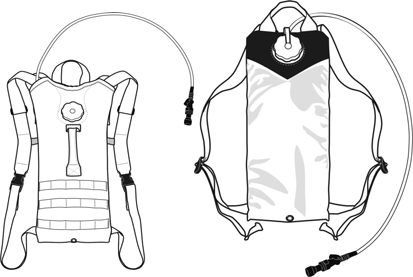 There are two similar designs (Hydramax, Storm) that are approved for use with the MOLLE II. Rinse hydration system with mild soap and hot water before first use and after each use. To freshen, add 2 teaspoons of baking soda to a full system of water and let soak overnight. Rinse well. To sanitize, add 2 teaspoons of bleach to a full system of water and let soak overnight. Rinse well. The use of liquids other than water will accelerate mold growth and will require more frequent cleaning.